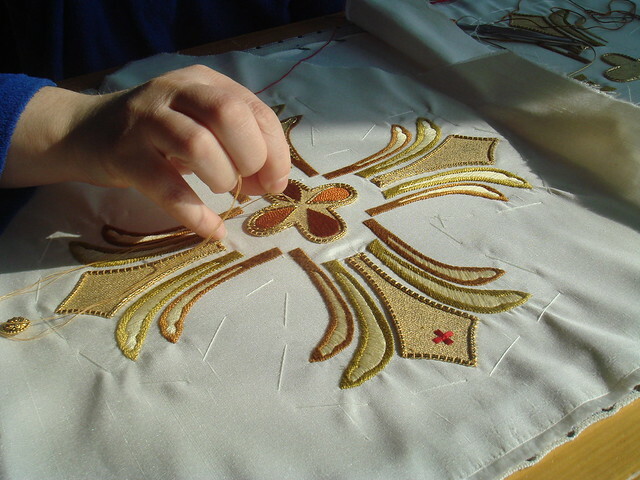 As the Thanksgiving Weekend comes to an end, its time to relax a bit and see what is going on in the history of vestment making, Ecclesiastical Sewing and Hand Embroidery. Over on Pinterest, there was an interesting church vestment link in the daily feed. Every once in a while, the link has an interesting photo, and the description entices the reader to click and learn more. You know how things work on Pinterest, one click and off you go to something else. The next stop was Flickr and the Stadelmaier link. And what an interesting link it turned out to be! Looking at the photos, it makes one pause: have you ever wondered about the vast numbers of Ecclesiastical Vestments used by the Catholic Church, and how that is done when there is a large event? The above Flickr photo stream might give a clue on how Ecclesiastical vestments are prepared for large events when hundreds of chasuble, mitres, dalmatics and tunics are needed. 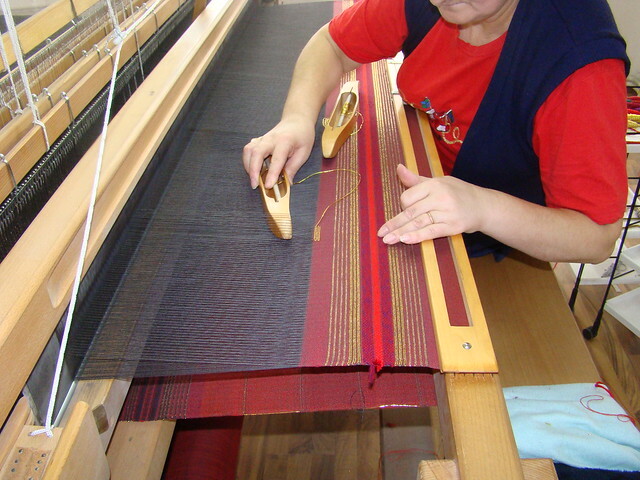 The Stadelmaier photo stream shows the background of a vestment manufacturer making Ecclesiastical Vestments: from the Vestment Design process to final construction, the photos tell an unknown tale. The photo stream also gives a clue as to how church vestments were made in the past by including a collection of old black and white photos. and hand embroiderers working on intricate Ecclesiastical Embroidery Designs. (Interesting to note that the embroidery is not framed “drum” tight as many embroidery books teach). The best part is the racks of hanging vestments, the table with countless mitres, and the organization of making sure everything is laid out and ready for wearing, and the special attention paid to the vestments of the Pope. It appears that sadly, Stadelmaier Vestments is no longer in business, but the photos are priceless in that they provide insight and the history of the vestment design and construction process many of us have never seen. Old photos can also serve as a source of design inspiration. Its fun to see the background on what happens at a vestment house. And it makes us thankful that none of us will have Ecclesiastical Sewing Projects on that large of a scale in the near future! Hope you had a delightful and relaxing Thanksgiving Holiday Weekend.